Linked Data Notifications is a protocol to facilitate sharing and reuse of notifications between different Web applications. It's a W3C Recommendation from the Social Web Working Group, and part of a push to help people own their data and re-decentralise the Web, particularly the Social Web. You can read more about why you might want to care about this here. For this post, I'm going to jump straight into implementation. I've chosen PHP, without any frameworks, because if you already have a (local or remote) server it should be quick for you to get going with, without needing to set up or configure anything. The "Linked Data" in the name implies involvement of RDF; in fact LDN uses JSON-LD, but I don't presume any existing understanding of these things for this post, I'll just try to introduce the minimum that you need as we go along. (For a nice intro to JSON-LD see Manu's YouTube video JSON-LD Basics.) I am assuming though you have a basic understanding of JSON, and what HTTP Headers are. LDN is a three part protocol. We expect front-end applications as well as servers to play the roles of senders and consumers of notifications. 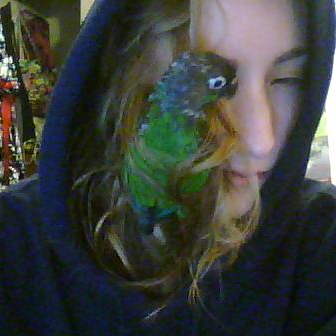 The third part is receiving. As the human in the mix, you need to tell the applications you use where to send notifications that are meant for you (or your software to pick up), as well as where applications can read them from (in order to display them back to you, or to process them and trigger other tasks to run). This 'where' is your Inbox. Applications might, for example, discover it from your homepage or a social media profile. You should host your Inobx somewhere you trust. Just like with email, some people might want to rent space from a provider, or maybe your workplace or school supplies one to you. At the moment the market for this is.. pretty small. This Web-data-owernship thing is in its early days. So for the pioneering developers among us, we can write our own, using around 50 lines of quick and dirty PHP. $inboxpath = "inbox"; // The directory where your notification files are stored. First, your script needs to accept HTTP POST requests containing JSON-LD blobs. We get the data from the php://input path. We also get the request headers. LDN receivers need to support as a bare minimum application/ld+json payloads, so we'll send a 415 if the Content-Type header doesn't match this. We're also going to check the payload parses as JSON since that's an easy way to throw out (with a 400 Bad Request) invalid JSON-LD. If you have a JSON-LD parser handy, you can validate it against that too. I haven't included one here because.. quick and dirty. Aside: If you do have an RDF parser around, you can accept other RDF serialisations like text/turtle. If you do, you should advertise this with an Accept-Post HTTP header on your Inbox. I use EasyRdf for all of my RDF stuff. If you don't want to include a library there are a few services with APIs you can call, like rdf-translator. The LDN specification says that even if you only accept JSON-LD serialized notifications, you should set the Accept-Post header anyway. You can do this in PHP with header("Accept-Post: application/ld+json"); or an .htaccess file with Header set Accept-Post "application/ld+json". Validate the notification according to its contents; maybe you want to only accept notifications of a certain @type, or other specific property-value (predicate-object) combinations. Validate the notification against a data shape. Verify the contents by fetching URLs you find in the notification and checking that data returned from these sources corresponds with statements about them in the notification contents. Verify the contents by checking the statements made in the notification against statements from your own (or another trusted) knowledgebase. Modify the contents of the notification by adding your own provenance information, such as the date you received it. Store the notification contents in a database or triplestore. Fire off a push notification to your phone. Aside: This implementation is super simplistic. The notification may come with an @id already set, or even contain several distinct subjects, pointing to resources somewhere else on the Web. Checking that referenced resources makes the same statements as the notification you received could be good practice for verifying the truth of the notification contents. It may also be set to "@id": "", which is relative to request; it basically means 'this'. You don't need to add your own absolute @id if it's already set; you can consider the URL at which you store the data as a graph URI, which contains statements about other things, but not about itself. Alternatively, you could wrap the notification data in @graph and apply your own @id on the top level. Since we're storing the notifications as JSON files, you probably want to tell your server to return JSON files with Content-Type: application/ld+json. You can do this by putting the following in a .htaccess file: AddType application/ld+json .json. In order to make your notifications reusable by other applications, you need to expose them to GET requests. Specifically, your Inbox needs to return a blob of JSON-LD which points to a list of the URLs from which the individual notifications can be retrieved. You probably want to put this behind some kind of access control, so that only applications with which you have authenticated can read your notifications. I use IndieAuth as a service. The listing doesn't need to look identical to this, but it needs to be an equivalent JSON-LD representation. Since there are several ways of presenting the same thing in JSON-LD, you might find you use a serializer that outputs something slightly different. For example, you might see the contains part shortened to: "contains": ["https://example.org/notification1", "https://example.org/notification2"]. You're also likely see the @context appear differently, and prefixes for the properties (keys) might be used. The JSON-LD Playground is a good place to look at different possibilities. Aside: The "@type": "ldp:Container" is optional for LDN, but it helps other LDP clients understand that they might be able to use your data too. You could store the Inbox listing in a flat file, and update it every time you receive (or delete) a notification. However, for this implementation we're going to generate it dynamically from the JSON files in our "inbox" directory. (You can take either approach if your notifications are stored in a database, too). $inbox = array( "@context" => "http://www.w3.org/ns/ldp#"
If you want to restrict access to your notifications, this is a good place to check the request against the authentication method of your choice (eg. a token in the Authentication header, or a signature of some kind). Now that's all done, you can put your script on a server and check it works with the LDN Receiver test suite. If it does, submit an implementation report! And that's all there is to it! The complete script is available here, for your copy-pasting pleasure (Apache 2.0 licensed). If you don't fancy writing your own script to handle LDN receiving, there are few existing implementations you could self-host on your own server. Plus Linked Data Platform servers work out of the box as LDN receivers, so maybe you want to set one of those up. Finally, we did something right. About reference implementations... The test suite automatically checks compliance, and most implementations are open source. From people who are already considering to include LDN in their projects, asking for technical tips. Authentication/login part... this isn't part of the protocol, orthogonal. About LDP and Web of Things... can devices send notifications? What if applications can't use JSON-LD? Well, that's part of the Rec that applications must be able to at least do JSON-LD, but to cooperating applications can use content negotiation to agree on a more lightweight RDF format if they want. It's important for interoperability to be able to send JSON-LD in case a receiver can't understand any other RDF syntaxes; but if your sender and receiver both agree on another format (via the Accept-Post header) they can use that. Do additions to the simple protocol make it complicated? What about spam? LDN recommends application-specific constraints to deal with issues like this. We don't have a blanket suggestion for how to deal with these kinds of problems in every domain though, we leave it to more focused experts. LDN is based on Linked Data principles, enables decentralisation, and persistence of data. 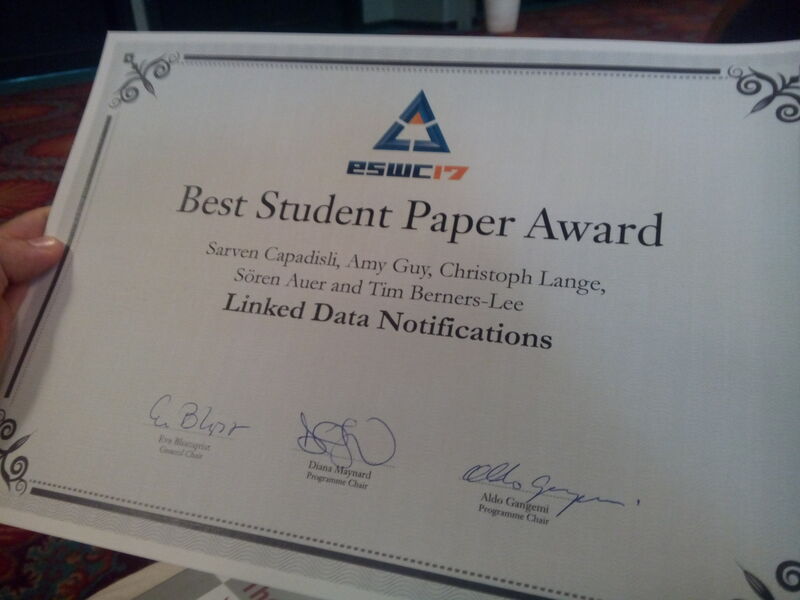 csarven presents Linked Data Notifications at ESWC2017... Starting with some motivational use cases in the social web space to which this W3C Recommendation has been applied so far. 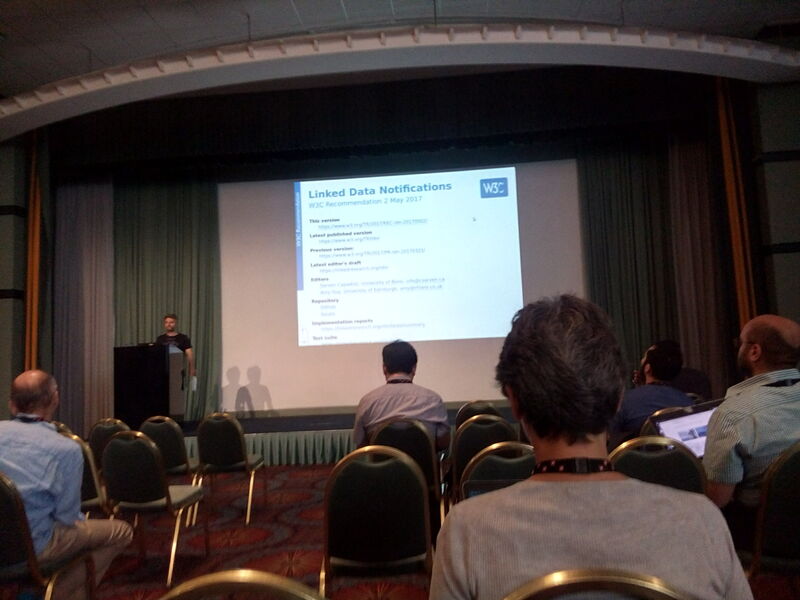 At 12, csarven will present Linked Data Notifications.. Come to the talk for an overview, then if you want to integrate a part of the protocol into your existing applications, or build a receiver from scratch, we're both here all week and ready to help!